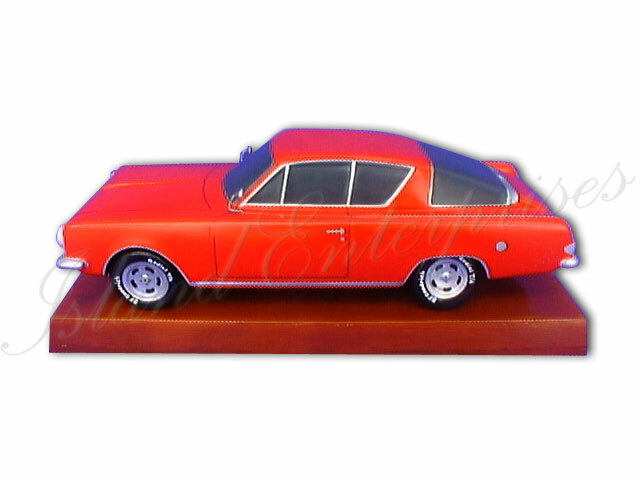 Island Enterprises - 1968 Plymouth "Barracuda"
Home → Aircraft, Car & Motorcycle Models → Cars and Motorcycle Models → 1968 Plymouth "Barracuda"
SURPRISE THAT LOVED ONE OR SPECIAL FRIEND WITH AN EXACT WOOD MODEL OF THEIR FAVORITE CAR, MOTORCYCLE, OR OTHER VEHICLE!!! We can produce a model of any vehicle you can get us photos of. These models are very accurate and extremely detailed. Standard size is 12" Long, on a custom base....However, we can make them any size and scale you desire. And remember we offer a 100% money back guarantee if you are not convinced you have bought the best product available on the market!! !